Niyaz (????) is an Iranian musical trio based in Los Angeles, CA, USA. The group was created in 2005 by DJ, programmer/producer and remixer Carmen Rizzo, vocalist and hammered dulcimer player Azam Ali, formerly of the group Vas, and Loga Ramin Torkian of the Iranian crossover group Axiom Of Choice. Niyaz is a Persian and Urdu word meaning "yearning". Niyaz's music, described as "mystical music with a modern edge", is primarily a blend of sufi mysticism and electronica. 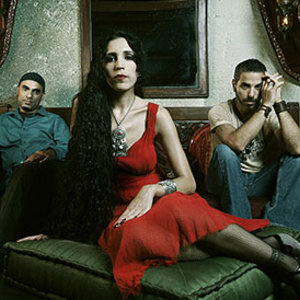 Niyaz's music, described as "mystical music with a modern edge", is primarily a blend of sufi mysticism and electronica. Niyaz adapts Persian, Turkish, and indian folk songs and poetry, including the poetry of Sufi mystic Rumi, with electronic instrumentation and programming.